Ships from China. Most customers receive within 3-10 days. - MINI TRAVEL ROUTER: Convert a public network(wired/wireless) to a private Wi-Fi for secure surfing. Tethering, 3G/4G USB Modem Compatible. Powered by any laptop USB, power banks or 5V DC adapters (sold separately). 40g (1.41 Oz) only and pocket friendly. - OPEN SOURCE & PROGRAMMABLE: OpenWrt pre-installed, USB disk and WebCam extendable. - LARGER STORAGE & EXTENDABILITY: 128MB RAM, 16MB Flash ROM, dual Ethernet ports, UART and GPIOs available for hardware DIY. - PACKAGE CONTENTS: GL-MT300N-V2 mini router , USB cable, User Manual. 2.28" x 2.28" x 0.98"
GL-MT300N-V2 router (1-year Warranty), USB cable, and User manual. Pros: Purchased two of these and both are working great! This is one of a very few inexpensive routers that has a USB 2.0, WIFI, LAN (RJ45 10/100) and WAN (RJ45 10/100) port that is configurable and usable with the Openwrt firmware (version 18.x). May use either USB 2.0, WAN or WIFI port as wan interface with Openwrt. Includes header for USB (3.3VDC) serial line interface. This unit also works great using only USB power (500 milliamp). The serial cable makes this router almost brickproof. All in all, this unit features functionality that comes with routers that cost 3 or 4 times as much. Cons: Two very minor issues. The selection for using the stock GL.iNET or Openwrt firmware is clumsy. Whenever the firmware reset button is activated the router boots to the stock GL.iNET installed firmware and not the Openwrt firmware, if that was being used. It would be really nice if the manufacturer would install a serial header externally on the case. I installed a serial USB cable by drilling a hole through the case and then attaching a USB 3.3VDC serial interface cable. Other Thoughts: I would definitely recommend this product as a personal wifi or lan travel router. 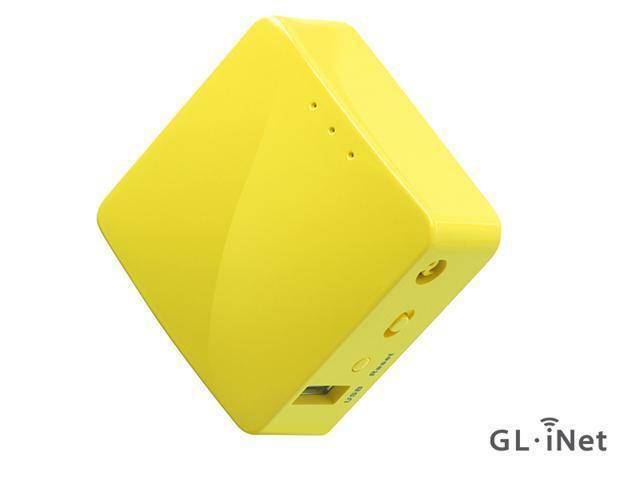 Cons: GL.iNet GL-MT300N-V2 Mini Travel Router is BRICKED ! Can not recover !! Stuck on 192.168.1.44 IP. Cons: Reboots when watching long YouTube videos ( constant traffic ) , seems to overheat ( gets very warm ). Added a heatsink, still reboots. Other Thoughts: Nice device and concept, it may be more secure than my old router, but my old router works.. back to it. Pros: Works great as a "poor man's" wifi mesh, just inexpensive multiple AP's around the house. Latest Openwrt software fixes the WPA2 bug. Cons: Software is a dumbed down version of the standard openwrt. And the Luci interface is also dumbed down. The Installation wizard works for the intended presets. But running as AP's isn't a preset. So SSH command line is required. But just follow the Openwrt documentation for access points. No power supply, just look for old USB phone chargers. Other Thoughts: Running an Ubiquiti ER-X and TP-Link Powerline Ethernet. AP roaming requires a much shorter beacon interval and lower transmit power via command line.